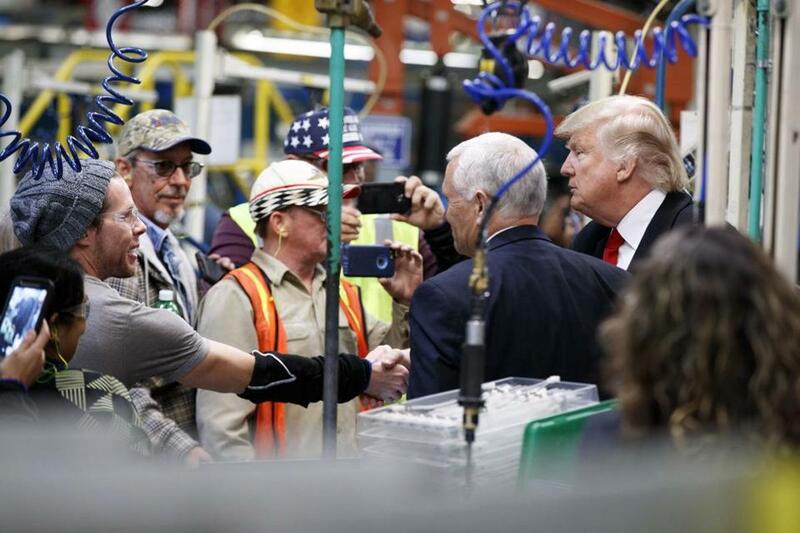 President-elect Donald Trump and Vice President-elect Mike Pence talked with workers at a Carrier factory in Indianapolis last week. 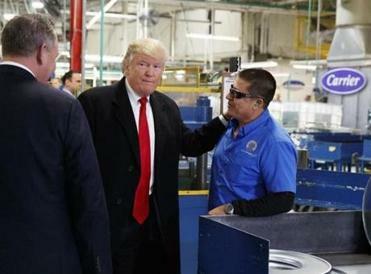 PRESIDENT-ELECT Donald Trump is a taking a victory lap after helping to keep some 800 Indiana jobs from migrating to Mexico — and tweet-threatening a future tariff attack on firms that make such a move. If Trump’s tweets signal intent — and one can never be sure — the threats are what’s most notable about this interregnal adventure in economics. Trump hasn’t said whether he would act unilaterally or seek congressional authority to impose those punitive tariffs. If the former, he would be on exceedingly shaky legal ground; if the latter, he would probably have a political battle on his hands. Still, let’s consider a few of the questions raised by Trump’s concept of captive capitalism. Why, for one, would it be appropriate to retaliate against a company that moves operations out of the United States in 2017 or thereafter but not similarly penalize products from a firm that left in, say, 1994 or 2004 or 2014? And how would such a policy work with companies that relocated some of their operation to a lower-cost country in order to keep competitive the overall enterprise, part of which would still be in America? In this instance, in exchange for about $7 million in state incentives, Carrier, which makes heating, refrigeration, and air-conditioning parts, agreed to retain in Indiana some 800 jobs it had planned to send to Mexico. Another 600 Carrier positions in the Hoosier State will still go south of the border, however. Further, an additional 700 jobs from a second Indiana plant owned by United Technologies, Carrier’s parent company, are also Mexico bound. Donald Trump said that US companies that move jobs out of the country could face a 35 percent tax on their goods. That reality prompts this query: How would Trump apply his policy? That is, what percentage of jobs must be retained here not to run afoul of his trade tax or tariff? Such a situation is obviously rife with opportunities for currying and granting favor, the more so since a parent like United Technologies has some $6.5 billion in federal contracts and is a sizable political donor. No wonder, then, that Trump’s pronouncement has confounded trade experts. It’s simply a bad idea. Perhaps the least troubling aspect is the $7 million in tax breaks that Governor Mike Pence’s Indiana extended to Carrier in exchange for those 800 jobs. That kind of deal is standard fare in state-versus-state economic competition. (That said, it encourages other, unfavored firms to demand similar treatment.) But it is not a realistic way for a president to operate across a complex US economy that has been losing hundreds of thousands of factory jobs each year. As showmanship, all this counts as a success for the Trump team. But as actual policy, a company-by-company carrot-and-stick approach would make for one colossal mess.